Me and my family spent the recent Holy Week in Boracay. We all had a terrific time, trying all sorts of adventures. We have also tried the restaurants littered all along the beach. 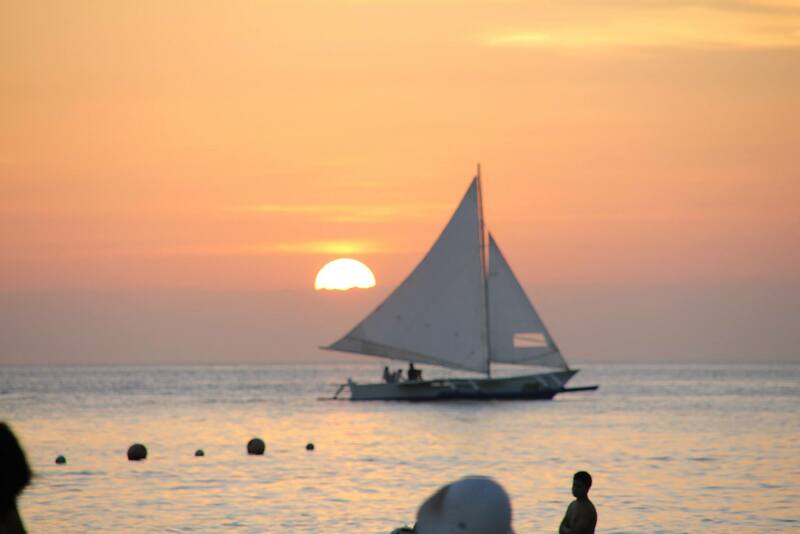 Our Boracay adventure started last April 17, 2014. We were at NAIA 3 at 9:30 am to check in for our flight to Caticlan via Philippine Airlines. Our flight was scheduled at 11:55 am, but was delayed by a few minutes. While waiting for our flight we strolled around, looking at shops selling souvenirs, coffee shops, and restaurants that littered the airport terminal. Some of us decided to have some coffee, while the others decided to look around the shops. We also decided to have lunch, before our flight, as the children in our group might be hungry before we reach our destination. We had lunch at Kenny Roger’s Roasters as the kids prefer this over the other restaurants. Our flight was overbooked and we were able to fly by around 12:30 pm. 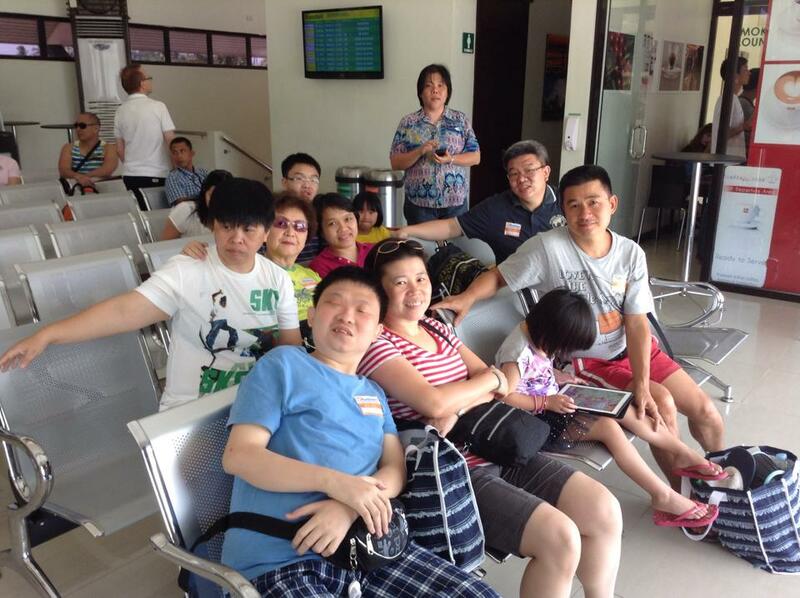 We arrive at Caticlan Airport at around 1:30 pm. Upon finishing with the arrival procedures we were greeted by our transfer service from South West Transport. They were courteous and guided us to our coaster, which would take us to the Jetty Port for our boat/bangka transfer to Boracay. The trip from the airport to the Jetty Port took only about 15 minutes. Upon arrival at the Jetty Port, we saw that it was packed with tourist, buying tickets for the boat/bangka transfer. The good thing was that our transfer service had their own counter for the payment of the P100 terminal fee and P75 environmental fee. We all paid the terminal fee and environmental fee, and was whisked into the waiting/holding area. While at the waiting/holding area, they gave us the tickets for our boat/bangka transfer, which incidentally was their own boat/bangka. We waited for a short while, before the boat/bangka was reeady, and were told to board it. The travel time from the Caticlan Jetty Port to Boracay Jetty Port took around 20-25 minutes. When we arrived there, we were greeted by the driver of the van that would bring us to Astoria Boracay, the hotel where we will be staying for 4 days and 3 nights. The ride took around 10-15 minutes. When we arrived at our hotel we were welcomed by the hotel staff. We finished with the booking formalities, we were escorted to our room, and given complimentary welcome drinks. The welcome drinks was okay, not great but it was able to do its task of quenching our thirst from the heat. Our resort rooms was quite big, able to sleep 3-4 people. It was well appointed. We booked 4 individual rooms for each family. There was a big screen TV, an inverter type airconditioner, microwave oven, in room safe, utensils, plates, and other amenities. The bathroom was also quite big, has a bath tub, wash basin, and was well stocked with amenities from dental hygiene kits, shampoos, conditioners, lotions, combs, cotton buds, etc. It was also sound proofed to keep the outside noise at a tolerable level. The key was an RFID key that you need to insert for the lights, electronics, and electricity to work. The resort has an acceptable adult and children pool. The had wooden floors on the pool area so as not to slippery and hot if you decide to walk barefooted. It also has a restaurant called, White Cafe, where we will be having our buffet breakfast for the past 4 days. The restaurant also has outside seating for those who want to eat with the beach view. And just beyond the restaurant is the pristine white sand beach. We decided to roam around and look for convenience stores, where we would be able to buy bottled water, and bread. We were able to find Budget Mart, and Julie’s Bakeshop just besides it at D’ Mall area. Since we arrived there in the afternoon, we decided to rest in our rooms, before embarking on our adventure during the coming days. 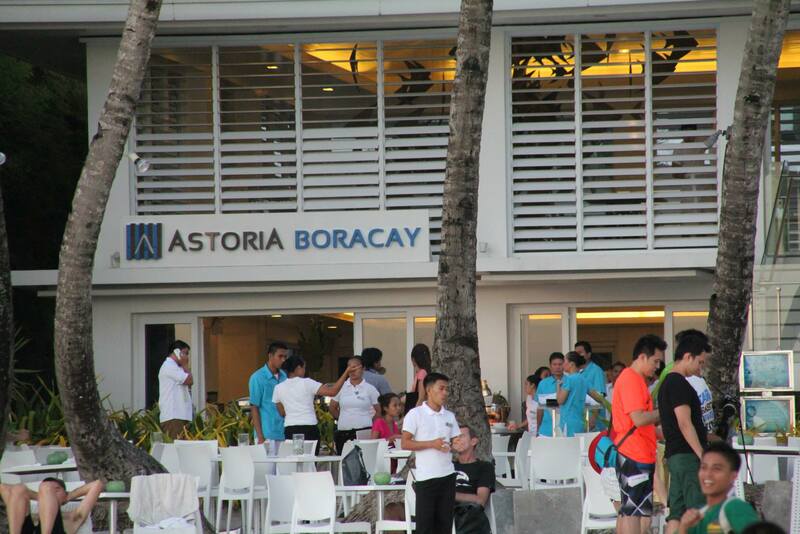 We decided to have buffet dinner at the Astoria Boracay restaurant, but opted for outside seating so we would be by the beach. There was a nightly performance, such as fire dancers, and a band after every session. This continued on until late in the evening. The buffet selection was okay. There were roasting/barbecue corner located outside the restaurant, and the rest of the food was located indoors. They also have a second floor, for those who want a little personal time. The next day, we had a hearty buffet breakfast. Then waited for the guys from Fun Philippines/JALS, for our Helmet Diving and Parasailing Adventure. The guide informed me that he would meet up with us just outside the resort. While waiting there were a lot of people passing and going, some selling items/food/drinks, while others were giving away free trial. I got a sample of the Pepsi Slush, which comes in either Orange (Mirinda), and Green (Mountain Dew), and also got some for my nieces, and my son. My son liked the Orange sample, that he asked me to buy the 12 oz. cup for him. This would entail my nieces to follow suit. At least this took their minds of the heat, and the waiting. Finally the guide arrived, and escorted us to the registration counter. He informed me that me and Mark, would be trying the Helmet Diving adventure first, then the Parasailing adventure later. A motorized boat/bangka brought us out to further to the seas to a floating hut, which is where we would be given instructions about Helmet Diving, also known as Helmet Diving 101. We were informed that the helmet would weight at around 25-35 kilograms on land, and would become lighter, about 1-2 kilograms, when we go down. We were told to climb down to a ladder until shoulder deep, then the helmet was lowered down on us. We went down the ladder. The current was a bit strong, moving us back and forth. They took pictures and videos of us, while helmet diving, and feeding the fishes with bread. We were under the water for around 20-30 minutes. We went up the ladder again to ascend. We were told to wait for a motorized boat/bangka which would bring us to our next adventure. The motorized boat/bangka finally arrived after 10-15 minutes. We waited until the passengers were able to disembark first. 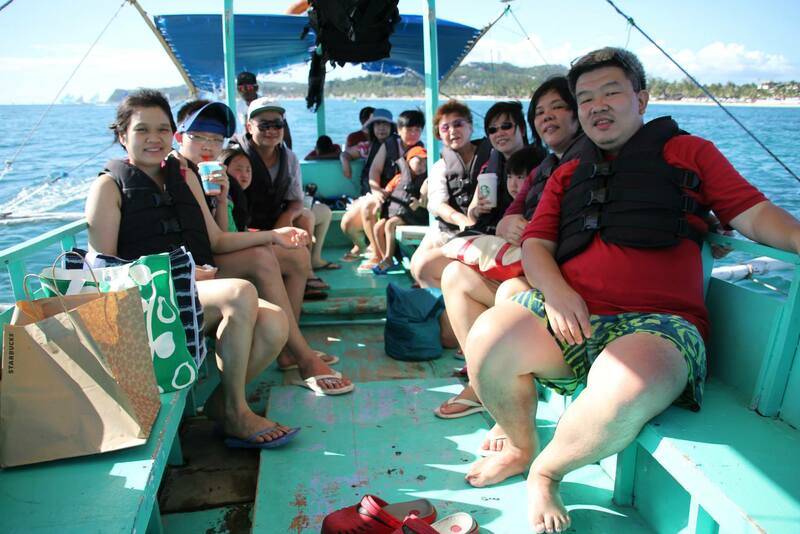 Then we embarked into the boat/bangka. 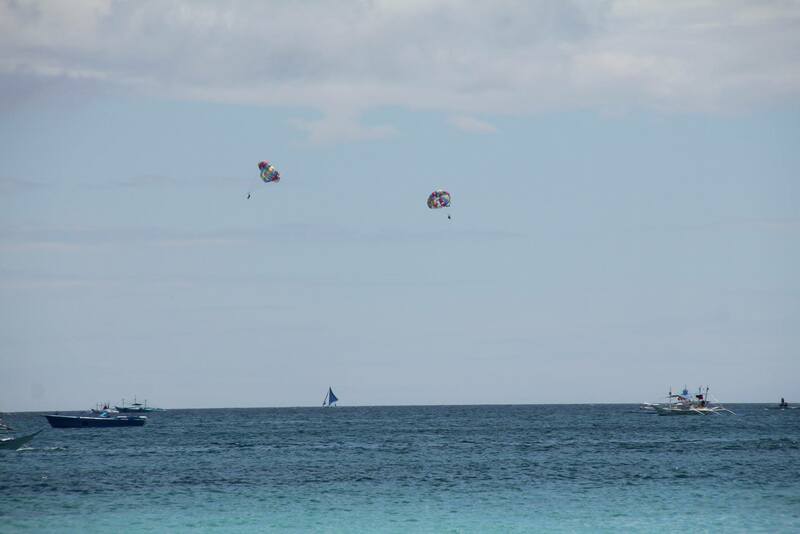 There were around 4 of us, who would be taken to another area of the sea, for our parasailing adventure. Upon arriving another floating hut, we disembarked, and were told to wait for the speed boat that would be our ride, for the parasailing adventure. Me and Mark were the first pair to be suited with safety harness, and other safety gears. We were told to seat down, and relax. When the speed boat sped up, we were slowly being lifted up the air. As the speed boat sped up, we went higher up in the air. I assume that we reached the height of around 100-150 feet in the air. It was a thrilling yet refreshing experience. We saw the sea, the shore, and the other islands while we were up in the air. We were up there for around 20-30 minutes as well. After us a Mainland Chinese couple followed soon. The man was able to speak a little English, and the woman mostly in Mandarin. They did the same thing we did. As soon as they were slowly being lifted into the air, the woman kept shouting/panicking. The man, after about 1 minute up in the air, signaled the operator that they wanted to be reeled in, as the woman kept shouting/panicking. We came back at around lunch time, and we all decided to roam around and look for some place to eat. We chanced upon Paradiso Grill, which served “Grilled” seafood, chicken, and other non grilled food. We had a hearty lunch, and decided to rest a bit, before swimming in the sea. On our way back to the resort, my son Mark saw Crazy Crepes, and he decided that he wanted to try it out. After swimming in the sea for a while, we showered and had change of clothes for Dinner. We roamed again, but this time took to the opposite side. We chanced upon Obama Grill Bar & Restaurant. AS the name implies it served “Grilled” food, but also served pasta, chicken, Bistek Tagalog (Beef Steak Filipino Style), soups, etc. We discussed about our activities for the next day, which would have been Zip Line, Glass Bottom Boat, and Banana Boat Ride. We walked back to our resort, and called it a day. The next morning, we met up with the same guide at the same place. We were led to the registration booth for formalities, of which after we were escorted to our Banana Boat Ride. 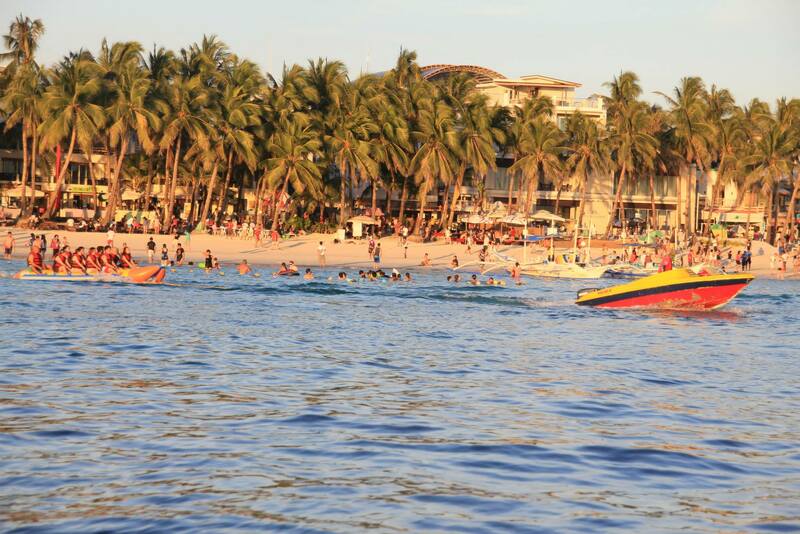 Me, Mark, Vivian, and Vicky were the only ones who wanted to try the Boracay version of the Banana Boat Ride. Initially it rained, which delayed our adventure, as the visibility would be poor. After the rained stopped, the speed boat slowly sped up. We held on tightly, even though we wore life jackets. The speed boat sped up faster and faster. Some of us barely was able to hold on. Some of us lost their balance, such as me and Vicky. But we were able to finish the ride, without anyone of us being thrown off the Banana Boat Ride. After the Banana Boat Ride, I took a shower by the beach, while Mark dipped into the pool. Me and Mark again waited for our next adventure, the Superman Zip Line. Our guide informed us that the Zip Line would be at the other side of the island, and that a van would be picking and driving us to the location. We were picked up and driven to the mountainous area of the island. It took us about 20 minutes to get there from the resort. 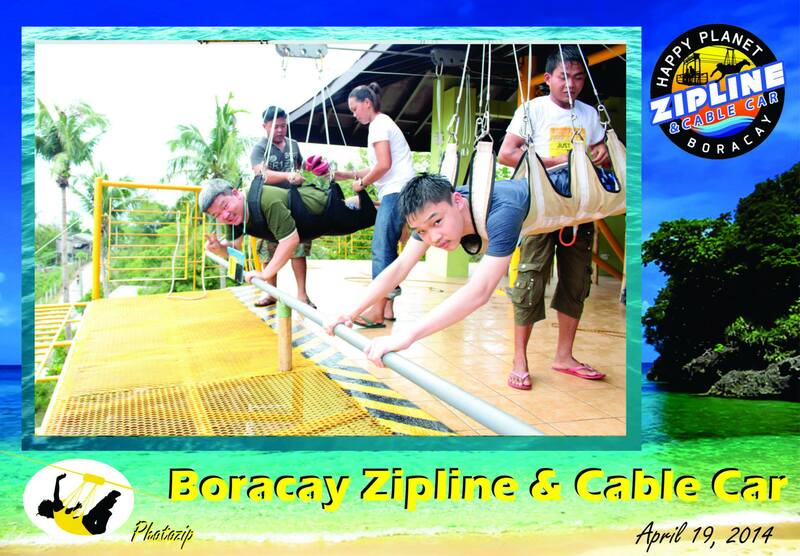 We were told to go up one floor, and register/sign a waiver, before we would be allowed up to the Zip Line platform. They suited us up, and tied us up for safety. The initial few meters was a bit exciting, but the further you go, and the faster you go, the feeling changed to that of being like a free bird, able to fly. We saw golf courses below us, and ATV’s. We were told to take the Cable Car back to the platform four our ride back to our resort. We took the van back, and met up with the rest of the family for lunch. Since we liked the food of Obama Grill so much, the night before. We decided to have lunch there as well. Bad idea! During dinner, there were not too many people, and the servers were able to serve the food immediately. While during lunch time, there were more people, and the servers had a difficult time serving all of the orders. We finished at almost 2 pm. We proceeded back to the resort, and rest, while waiting for our 3 pm Glass Bottom Boat adventure. The guide texted/SMS me that the Glass Bottom Boat was out of order, and that it was the only one on the island. So we decided to have an Island Hopping adventure instead. The guide told me that the Island Hopping adventure would last for about 3 hours. We were promptly picked up at around 3 pm. And we were off! 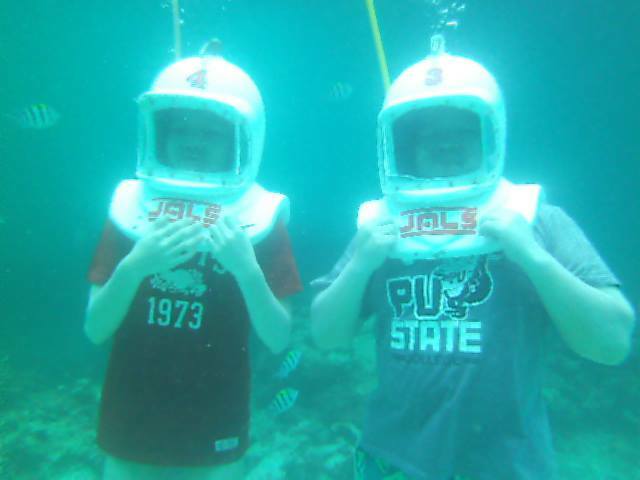 We stopped by after a few minutes to go see some fishes, and snorkeling. We spent around 15 minutes there, after we went to the other side of the island. The sand there was a bit rough, the waves/tides were a bit strong, and the water was more than waist deep after a few meters, unlike the beach in Station 1, were in a few meters, and the water is still below the knee. 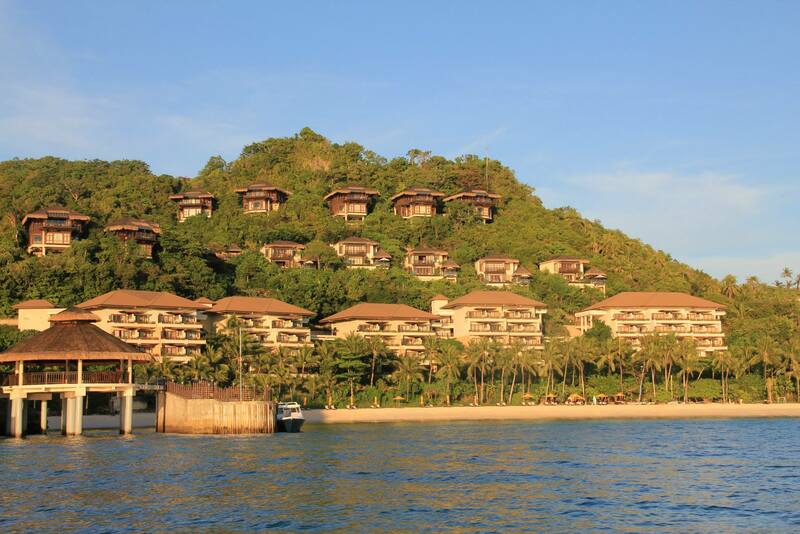 We spent a few minutes there, and then proceeded to see the Shangrila Boracay Resort, which the guide told us commanded a P25,000 a night price. 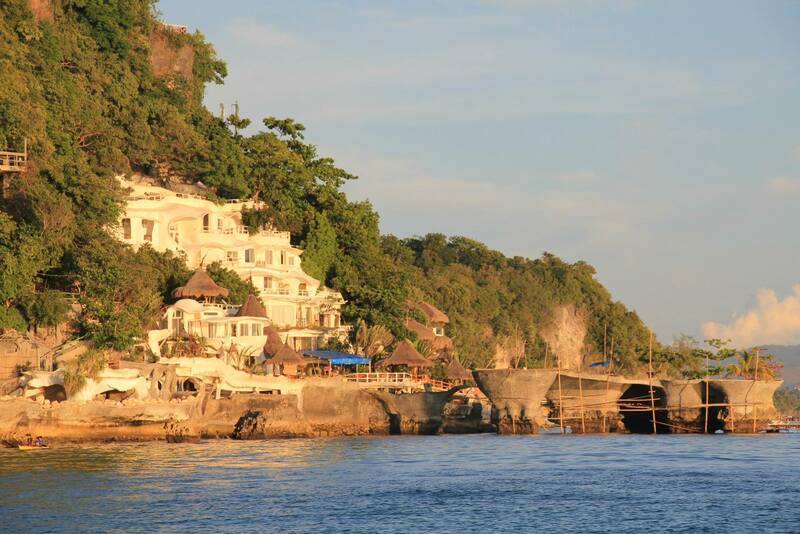 And also we were shown the famous Boracay West Cove, which was the news item for a few weeks, and according to the guide, was co owned by Congressman Manny Pacquiao. Almost 3 hours had past, and we were back to the starting point. We took a shower, and some rest. Me and my family decided to eat in, as they were very tired from the days activities. So I went out, and bought Four Cheese Pizza from Yellow Cab Pizza for Emily and Mark, which was just besides our resort. I decided to buy from The Original Hawaiian Barbecue. I ordered their half chicken, which was juicy, sweet, and big. We also prepared everything as tomorrow, we would be picked up by the transfer from South West Transport, at 8 am. Then we called it a night. Early the next day, we ate breakfast at around 7 am, and after we finished, did a final sweep of our resort rooms, to check if we might have left something in the room. As usual, the transfer was punctual, even early. The trip lasted for about 15 minutes. We arrived the Boracay Jetty Port at around 8:25 am, and was escorted to the terminal fee counter of South West Transport, which we politely paid. After payment we were escorted into the waiting/holding area, to wait for our ferry service to Caticlan. Arriving in Caticlan we were asked to follow the guide, who led us to a coaster, which bought us to the Caticlan Airport in 15 minutes. We checked in at around 9 am. After finishing with all the check in formalities, we waited to go into the boarding area. We saw, Mr. Kim Atienza, a famous news casters/weatherman, with his family. We paid our terminal fee and went into the boarding area. Our flight was a bit delayed.